Q: What is the reason that water is occassionally dumped through the channels and ducts? Q: What is the significance of the word "apple core", that was overheard by one of Jake Gittes' associates during the argument between Hollis Mulwray and Noah Cross? There is a word, impossible to spell, that describes the alignment of solar bodies like the planets when they all fall into place together. A similar word would describe this film. Everything about it is right. Polanski never directed a better movie. The performers, down to the lowest atmosphere person, are superb. The editing, the score, the sound, the decor, the dialog, all are just about flawless. The photography is peerless. The white garden apartments, the terra cotta roof tiles, the palms and desert sand are all painted with a faint gold, faintly ripe with false promise, like the oranges that bounce from Gittes' desperately speeding car in the northwest Valley. Polanski deserves much of the credit. When Gittes surprises Evelyn Mulwray in her car, after he follows her to her daughter's house, her face slumps forward and beeps the horn briefly. Then, so faintly, we hear a few dogs bark in the background. 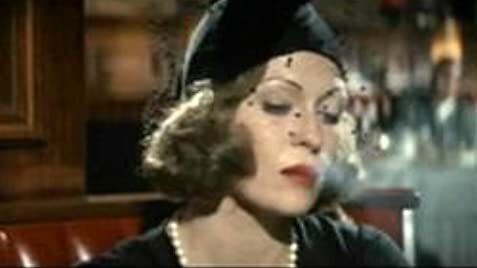 Not only is the scene itself exquisitely done but it prefigures the ending, as does Gittes' remark earlier to Evelyn that she has a flaw in her iris. The movie is too good to deserve much dissecting. It stands repeated watching. If there is anything wrong with it, it is the serious and tragic ending that Polanski always insists on tacking on. Robert Towne was right and Polanski wrong in this case. Everything came together on this film. It's not only the best detective movie ever made; it's one of the best movies ever made -- period. A marvelous job by everyone concerned. I have to add (6/27/05) that the word I mentioned in the first sentence is spelled "syzygy." Man, did I get enlightening email on that. I might as well add two other impressive features of this movie. (1) Polanksi takes his time. Example: Gittes sneaks into Hollis Mulwray's office and begins to go through the drawers of his old-fashioned wooden desk. As he slides each drawer out, Polanksi gives us a shot of their humdrum contents (checkbooks, magnifying glass, and so forth) and we can almost smell the heat and the odor of shellac and sawdust emanating from the wooden containers. The contents reveal nothing of importance in this case. But (2) sometimes irrelevant information crops up that resonates later in the film with its own echo. The detail might be just a word ("applecore") or an ordinary object (a pair of spectacles found in a pond, immediately after Gittes imitates the Japanese gardener's remark that the water is bad for the "glass.") Some of the references may be so consistent as to constitute a theme (water). None of this hits you over the head with its significance. It's all very neatly stitched together. 219 of 302 people found this review helpful. Was this review helpful to you?